The Insurance Institute for Highway Safety reports that blind-spot related collisions claim the lives of approximately 300 people every year. Most drivers check their mirrors before making lane changes. However, a vehicle may be traveling beside in the blind spot and go undetected. However, blind-spot detection systems reduce the number of collisions by 14 percent. The technology might be referred to as blind spot monitoring or lane assist. The safety feature functions using cameras or sensors strategically located around the vehicle that continually monitor the area around the car, truck or SUV. 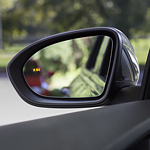 When the system detects a vehicle hovering in your vehicle's blind spot, the driver receives some type of warning. The alert typically involves a flashing light on the side mirror. Some vehicles activate the system when the driver activates the turn signal. Learn more about the safety features of our vehicles by going for a test drive at State Park Motors.